Thursday’s Bag is from Coach and its a little different from what we usually choose. But I know my Fab Fans can roll with it. Plus, Fab Girl Sabrina, is a bonnafide COACH addict, so I had choose this one. Actually there’s an aqua blue suede version that I ADORE, but couldn’t find a picture to put on the website. 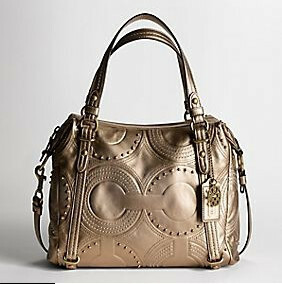 However, metallic continues to be hot for Fall, so you can’t go wrong with this slightly studded Coach creation. Plus, this bag can go from a handbag to a shoulder bag with a simple addition of a strap; that’s a good choice for a lady on the go. I say we add it to our fall bag collections. Can't go wrong with a coach bag!